Iconic couples' therapist and bestselling author of Mating in Captivity Esther Perel returns to paperback with a provocative look at relationships through the lens of infidelity. An affair: it can rob a couple of their relationship, their happiness, their very identity. And yet, this extremely common human experience is so poorly understood. What are we to make of this time-honored taboo-universally forbidden yet universally practiced? Why do people cheat-even those in happy marriages? Why does an affair hurt so much? When we say infidelity, what exactly do we mean? Do our romantic expectations of marriage set us up for betrayal? Is there such a thing as an affair-proof marriage? Is it possible to love more than one person at once? Can an affair ever help a marriage? Perel weaves real-life case stories with incisive psychological and cultural analysis in this fast-paced and compelling book. 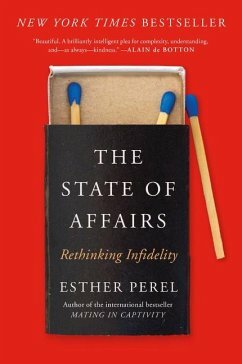 For the past ten years, Perel has traveled the globe and worked with hundreds of couples who have grappled with infidelity. Betrayal hurts, she writes, but it can be healed. An affair can even be the doorway to a new marriage-with the same person. With the right approach, couples can grow and learn from these tumultuous experiences, together or apart. Affairs, she argues, have a lot to teach us about modern relationships-what we expect, what we think we want, and what we feel entitled to. They offer a unique window into our personal and cultural attitudes about love, lust, and commitment. Through examining illicit love from multiple angles, Perel invites readers into an honest, enlightened, and entertaining exploration of modern marriage in its many variations. Fiercely intelligent, The State of Affairs provides a daring framework for understanding the intricacies of love and desire. As Perel observes, "Love is messy; infidelity more so. But it is also a window, like no other, into the crevices of the human heart."